ZF is Europe’s largest and most technically advanced independent transmission manufacturer, producing transmissions for a wide range of applications from cars to ships and from construction equipment to railway locomotives. It is also one of the world’s leading suppliers of driveline and chassis components, posting a turnover of 12.5 billion euro in 2008. The ZF Group employs approximately 60,000 people across the globe at 125 production sites and 700 service and trading centres. Committed to engineering excellence and innovation, the group reinvests more than five per cent of its earnings in Research & Development and has 4,600 technologists dedicated to maintaining its technical leadership. ZF Services is a wholly-owned subsidiary of ZF AG, responsible for the UK aftermarket and support of the complete range of ZF products in the British Isles. The company has an annual turnover of £49 million and a workforce of around 200 people based at facilities in Nottingham & Crick. 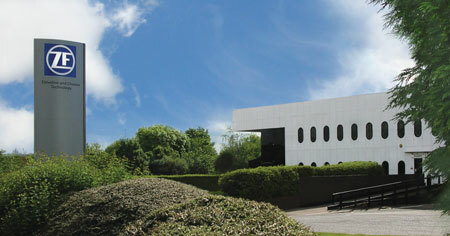 The Nottingham plant is the centre for unit repair, overhaul and remanufacture and for technical service support. Established more than 30 years ago and based on a 13,000 square metre site, ZF Services in Nottingham employs 150 people, 80 of whom are technically trained and qualified to ZF’s stringent original equipment (O.E.) manufacturing standards. Accredited to ISO 9001:2000 and environmental management standard ISO 14001, Nottingham’s dedicated facilities support the full range of ZF products. 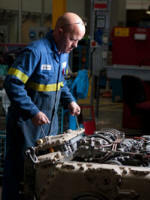 ZF Services in Nottingham works on behalf of ZF’s defence division. This includes providing technical support to military vehicle builders and field service for the UK’s Ministry of Defence forces and other European armies using ZF equipment. Nottingham technicians have been engaged in supporting military vehicles in Kuwait, Iraq and Afghanistan including upgrading ZF transmissions for the AS90 self-propelled gun.